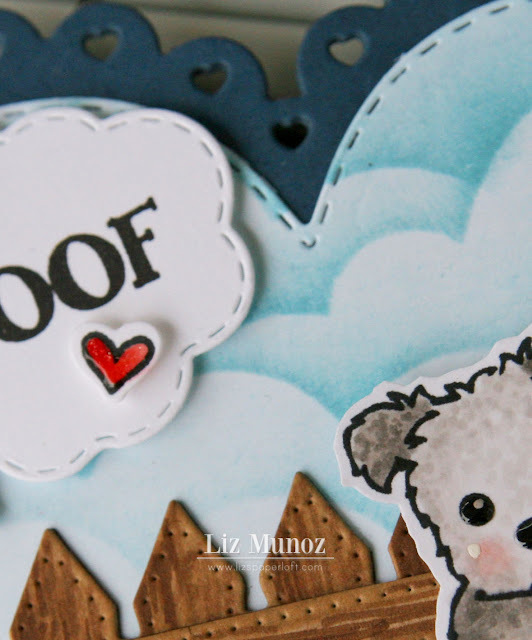 Liz's Paper Loft: MCT January Release Sneak Peek Day 1 ~ woof! Welcome to My Creative Time January Release Sneak Peek Day 1! This All Die release is the perfect addition to your "core" set of dies, that can be used over and over again. Today I get to share with you More Scalloped Heart Dies. I wanted to show you this isn't just for Valentine's Day. Ooh, how SWEET! What an adorable scene on your heart! Cute idea! So so cute! Love the heart with the background cut to the heart die cut! I always love that particular puppy. So sweet, great new heart dies! This little card is absolutely darling! I love how you did the cloud background and cutting it out with the new heart dies to place that cutie pie doggie! What an adorable heart! love the coloring!! So much inspiration on here. Aww! Way too cute! Love you card! OMG Miss Liz What an Adorable and Beautiful Card!! Your sky turned out Spectacular..Your stencil idea is brilliant and ingenious and sure makes for a Gorgeous Sky. You little scene is so darling and your little doggy is cute...you so did an incredibly coloring job!! All of your creative ideas sure showcase today's sure showcase today's sneaky peek in a Magnificent way. You so did a Super Outstanding Creative job!! YOU so ROCK!! Such a CUTE card. Love the new die. Love the versatility and your super cute card is wonderful! Adorable!! Love the little scene!! Your card is just as cute as can be! Love this little scene, Liz! Oh my! This is so adorable! Beautiful coloring, Liz! Such a darling card! That little dog is adorable and I really love the background! Super cute! This is just precious. The coloring and the stencil work is perfect. You are so gifted. Thanks for inspiring us to want to make things pretty. Oh how sweet is this Valentine card with the pooch. I love everything you did, you are so talented! Great job. This is just the sweetest! Omg! What a beautiful and adorable scene on your card! Adore the heart shaped card! Love the scalloped shape along with the heart detail then add that super duper cute puppy image and I'm sold! I must have these dies! Wow! Your little scene is adorable! I love that you used new and OLDER MCT products. Always love to see what you come up with! Thank you for sharing! OMG, this is just too sweet for words! Gorgeous! What a beautiful scene you created! I always love the little details you add to your cards from the cute little hearts, clouds and grass etc! Darling! This is just super cute! That dog is one of my favorites too, and I love the background you created with the stenciled clouds and the fence! How adorable, love the images,great job with the coloring and use of the dies! Cute card - love the heart shaped card! What a fun, new die set - love the scalloped hearts! so cute with the heart shaped scene. Oh my word! Your card is adorable <3 I love how you did the sky and the texture on the puppy and fence. Great job. Awww...super cute card Liz! Lots of detail and enjoyed looking at every single thing used to put it together. Woww, who would of thought to make the heart blue for a background. Great work and detail! This is adorable, the details you put on this creation is amazing! Wow! I like the colors and the stitched heart/cloud. I loved how you used that heart in a simple tag that everyone can adore! What a fabulous scene card. Love the cute dog. What a sweet little scene. Love the heart dies! Absolutely adorable!! Love the scene you've created!! !